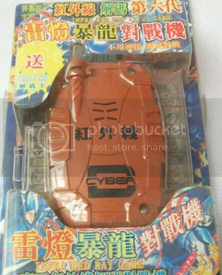 There were many bootleg digivices in China at the time digimon is popular. All of us in China have bought the fake digivices before. Now those fake things flow into international market, so you may get a fake one with a high price. 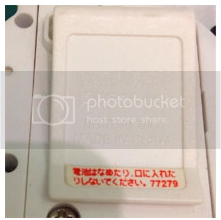 I have wrote an article in China's discussion board before, to tell everybody how to identify the bootleg digivices. When I get on ebay today, I'm surprised that there are 3 fake Japanese D-3, and a lot of people are placing bids! So I try to share my article here, to help everyone find them out. Here I don't discuss those bad fakes that you know they are bootleg when you see them in your first eye. What I tell here is the ones that looks really like the original. You may think those are good ones if you don't have the way to check them. All the color in version 2 could have the chance to be a fake one. Transparent no color body + Blue button. Black body + White button. Purple body + Yellow button. greenish yellow body + Purple button. Glow in the dark body + White button. 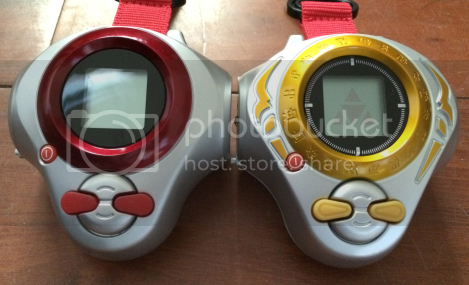 It's easy to tell which digivice ver2 is a fake one. Please see the wire on the back. 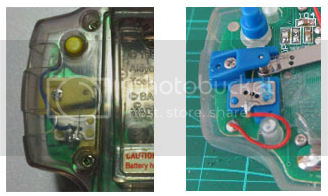 The left one is original, the wire goes from top to below. The right one is fake. The wire stays at the lower part. 1. You can't push the button to beat a digimon in the mini card game. 2. When you walk 50,000 steps, there is no auto - Mega evolution action. All the color could have a fake ones. Version 1 Colors: White and blue; Blue, green and red; Black and white. Version2 Colors: White and Red; Blue and white. Version3 Colors: White and Yellow; Black and Blue. If you see the digimon and the color is not matching, then it is fake. Example: You see a V-mon in a black and blue D-3. Then that's a fake one. If you see a color that is not exist, then it is a fake one. Example: You see a White and Green color. *I don't know whether there is a fake limited version 1.5 or not. I have never seen a fake one of it. Original: There is a little dot on the top of the air wire. Fake: No dot on it. 2. The sticker on the clip. Original: Different colors have different numbers. Fake: All the number is the same. Writes: 77279. *The number 77279 is copied from the original White and red D-3 ver2. 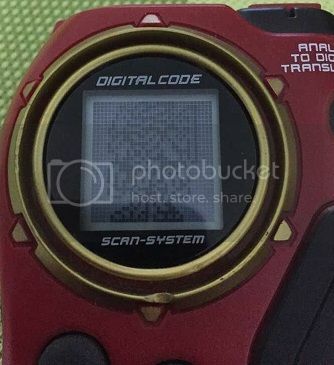 Here is the correct number on the original D-3 digivice. Please check before you buy a D-3. It's really bad of the fake one if you have played both. Sound effect: Bad. Try to copy the original one but failed, sounds strange. Shaking: Bad. It's hard to make it count steps. 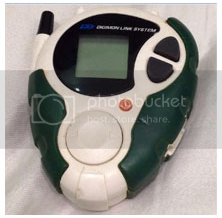 Digimental detect: Some fake D-3 can't find anything because there is no coil on the board. But some can. Enemy: lack of enemies, even less than the original. The fake d-ark is extremely like an original one. All the colors could have a fake one. Original: Only the Ultimate D-ark have a round of graduation. The Others is just all black. Fake: Some have a round of graduation on the screen even if it is not an Ultimate D-ark. Fake: All the number is the same. Writes: 77279 or 00166. *The number 00166 is copied from the original Silver and red D-ark ver1. 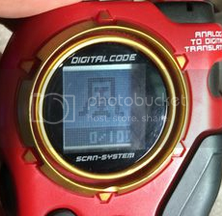 Here is the correct number on the original D-ARK digivice. Please check before you buy a D-ARK. Original: Only slash a card will work. Shaking is no use. Fake: When you need to slash a card, you could shake it to replace a slash. The fake d-ark is really a good one, it just look like an original one. Sound effect: Nearly the same as the original one, but still some different. The winning music is missed and replaced by the happy music. Shaking: Bad. Hard to make it count steps. Enemies and maps: The same as the original one. But some bitmaps of the digimon have bugs. *The ImperialDramon Paladin mode in the fake Ultimate D-ark is replaced by the ImperialDramon Fight mode. Link system: Can not link to the WSC. Only version3 have fake ones. The fake scanner is nearly the same as the original one. 1. the number on the clip. YES THE NUMBER IS IMPORTANT!!! The fake one is very dark. ↓the screen of the fake D-Scanner. 3. When you reset your D-Scanner and load the SAVE DATA. Original: Will load the data. Fake: Will not load the data and start with WIND. Barcode Scanning: Only two result will come out in 1 bar code in the original one(one from each side). The fake one comes out randomly. Lucemon battle: Runs each time and return with the same hp last time it ran in the original one. The fake one will reset to full hp so you will never defeat it. Last edited by donald; 06-12-2015 at 07:39 AM. Reason: Add the d-scanner indentification. Thank you very much for this article. I will be a great help to collectors, or just people who want to get back a toy from their childhood. Rather than merge this with the other thread, I think I'm going to sticky it along side it to act as a guide. Good post. Thanks for helping me confirm my suspicions. I was nervous while reading this that my Digivices would be fakes haha. How bout the D-Cybers? Where would I look to spot fakes, or has anyone made fake ones? *Exactly there is... But.. I think it is unnecessary to point it out..
You wouldn't think this is an original one, and the content inside is no connect with the original one. Last edited by donald; 04-14-2015 at 09:00 PM. Okay. Thanks for telling me. I am still trying to get mine fixed at this time. I was just curious. I checked my d-3 collections. Last edited by donald; 06-04-2015 at 03:31 AM.